How FX Options Market Works ? The fx option market is traded according to delta levels rather than strike levels. Traders ask quotation for a specific delta level and expiry date. The price is quoted as volatility. >Please 1M USD call TRY put 35D, in 10. >11.25 pls, spot ref 1.7950. In the above conversation one trader asked the other one, the price of the 25 delta USD call TRY put option. Price is quoated as volatility and the trader who demanded the quotation, bought the option from % 11.25 volatility. The volatility % 11.25 is the corresponding volatility for 1 month 35 delta strikes in the volatility smile. The volatility smile implies that different volatilities should be quoted for different delta levels. (Strikes) This volatility is also called market volatility. Since it is not possible to publish the every point in the volatility smile as quotation, the standart volatility quotations traded on the market are 25 delta put, 25 delta call and at the money levels. Traders should have a model in order to have an idea about the 5 delta implied volatility while giving two way quotations to their customers. This model should interpolate the implied volatility for required delta level by using the three standart implied volatility levels as input. (25 delta call, 25 delta put and at the money) When the trader calculated the interpolated market volatility from his model, he can use this volatility in the standart Black Scholes model for European options. The result will be the premium or the price of the option. While traders talk in terms of volatility on trading, the corporate or individual customers ask for the price or premium. The implied volatilities for 25 delta call and 25 delta put are quoted implicitly in the market. Market trades the values of 25 delta riskreversals and butterflies instead of the implied volatility of the 25 delta level. The mentioned model for the interpolation of the implied volatilities should use ATM vol, RR25 and BFLY25 as an input for each expiry level. A trader needs to have a volatility matrix smilar to below table in order to price the fx options for different expiry dates. The fifth column is the volatility spread which will be used on generating the bid and ask spreads. Since the quotations are based on volatility in the options market, the bid and ask spread for the premiums are also generated by using the bid volatility or ask volatility value in the models. 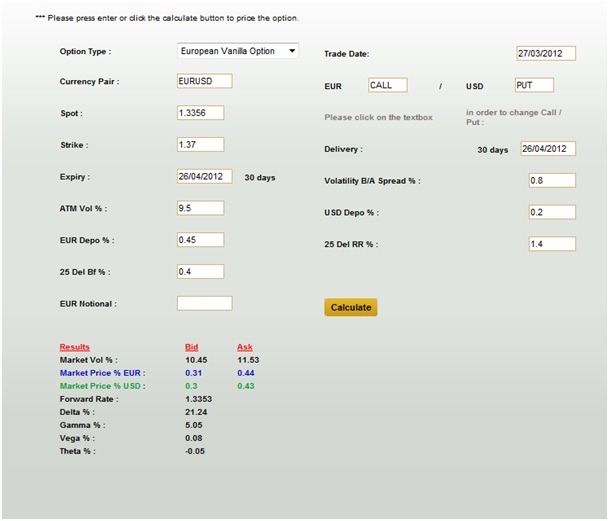 Have a look at the below example from Derivative Engines ‘European Vanilla Option’ calculator. The volatility interpolator model in option calculator of Derivative Engines, calculated market vols as %10.45 bid and % 11.53 ask. If you look carefully the bid and ask spread between % 11.53 and % 10.45 is % 1.08. Why ? The volatility spread quoted in the market is for the at the Money volatility which is % 9.50. Trader should calculate the bid ATM vol and ask ATM vol by using this spread. We get % 8.96 for bid ATM vol and % 10.04 for ask ATM vol. Generaly for the simplicity no bid ask spreads are applied to bfly and rr levels. The bid ATM and ask ATM values are used in the volatility interpolator model as an input and the outputs of the model are % 10.45 bid market vol and % 11.53 ask market vol. 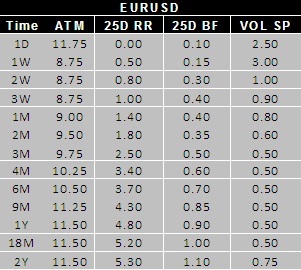 When these market vol figures are used in an option pricing model trader gets the bid and ask prices fort he european vanilla options as in the above example.